A Life: Lawrence Ferlinghetti Beat Generation, Rebellion, Poetry. 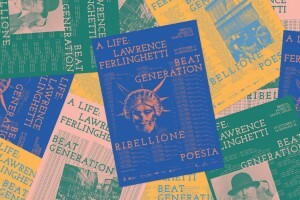 Fabrica has curated the setting up and the communication project of “A Life: Lawrence Ferlinghetti. Beat Generation, Rebellion, Poetry”, an exhibition highlighting the importance of the figure of Lawrence Ferlinghetti – American poet, painter, publisher and cultural agitator with Brescian origins – in the literary scene of the 1950s and 1960s, and in particular within the Beat Generation movement. The exhibition also highlights the importance that the Beat had in Italy, thanks in particular to the activity of Fernanda Pivano, so as to become a cultural, musical and popular phenomenon. The exhibition is therefore an opportunity to retrace history and recreate the atmosphere of those years through print materials (first editions, posters, leaflets and objects), video and audio recordings (from jazz to readings) and photographs (by authors of such as Robert Capa, Aldo Durazzi, Larry Keenan, Allen Ginsberg, Christopher Felver and Fred Lyon, along with the great pictures taken by Ettore Sottsass), many of them unpublished.